Breaking Bad episode guide: Does Walt have cancer? I think the cancer’s back. Bryan Cranston in Breaking Bad. At the risk of starting a ruckus, I’m surprised neither of you seemed as disturbed as I was by the abrupt “yadda yadda” of a montage we got. To me, the idea that the decisive murder of Mike’s guys set us up for a months-long flash forward contradicted all the important stylistic and thematic tenets of the show. There’s always another problem in the meth game. There’s always another loose end. But somehow after everything we saw in the first four-and-a-half seasons, Walt’s relationships with everyone are just going smoothly? Declan’s happy with his 35 percent. Lydia’s calm and fine. Walt isn’t paranoid that Todd’s going to murder him as soon as he learns the cook. The other Vamanos pest guys just do their jobs quietly and without complaint. The neo-Nazis don’t demand a cut of the business once they realize—courtesy of their extremely well-placed informer—that Walt has no muscle to speak of. It’s not that you can’t imagine reasonable scenarios for these issues. But Breaking Bad has been all about taking us, step by step, through every logistical snag, ego clash, and fussy little detail. After the wild capers with the magnets and the train robbery, I thought being left with a terse “figure it out” as an explanation of how you kill nine witnesses held in separate facilities was a huge disappointment. Where’s my granularity? The show didn’t even let us know what the going rate for a New Mexico prison-spree killing is. Similarly, Lydia launched this season as a promising new character but is ending it as a kind of unfortunate deus ex machina. Need an ocean of methylamine? Here’s Lydia! Need a distribution hookup in Prague? Lydia’s got one! That said, disgruntled though I may be, the show’s sure got me hooked at this point. The flash forward annoyed me at the time, but now I think it’s a masterstroke. I’m obsessed with how we get from Point A to Point B.
I do think the cancer’s back. It’s not just the scan per se. It’s the visibly dented-by-a-punch paper-towel dispenser. And also Walt’s change of heart. Vince Gilligan had sort of written himself into a corner with the whole Walt-is-now-Scarface thing—after that kid got shot, he couldn’t really become more depraved—so his protagonist badly needs a sudden personality transplant. A cancer recurrence is just what the script doctor ordered. My juiciest speculation for the last eight episodes is that Hank will somehow get sucked into a cover-up. June, you asked if anyone would believe Hank that he didn’t know about Walt if it all came to light. I think he could be persuasive about it. But I don’t think his career could survive the revelation. The previous ASAC got canned for a much less embarrassing screwup. And it’s worse than that. The Fring case is really the whole basis for Hank’s promising career at this point. If it turns out that he’s less the genius who cracked it than the sap whose brother-in-law was a key player the whole time, suddenly Agent Schrader is looking much less impressive. And then there’s Skyler and Marie to think about, to say nothing of the White kids whom Hank clearly adores. Skyler’s been fashioned as a sympathetic character for most of this season, but dollars to doughnuts the first thing Hank will investigate now that he’s suspicious is the mysteriously acquired car wash—where she’s guilty guilty guilty. Does Hank want that darling baby girl growing up with her parents in prison? Especially with Walter getting out of the game? So I think the biggest problem may not be the DEA after all. Rather, as you say, Emily, nobody really just gets out. Walter’s deranged “I’m in the empire business” bravado this season has been distracting the whole White family from that basic reality. There was a brief opportunity to get out—maybe—when Fring was dead and Mike and Jesse wanted to quit. Even if Walt had walked back then, the mishegas with the legacy costs still might have ended up dragging him back in. But now that Walt’s forged a stable, collaborative partnership with other criminals, what are the odds he can just walk away? Sunday night gave us so much telescoping that it’s hard to know exactly what snags this plan will hit moving forward. But there will be snags, because an empire is a big deal. Rolling up the Fring empire required the murder of over a dozen people. The idea that the Heisenberg empire can just be settled with a handshake and a self-storage container full of miscellaneous denominations isn’t credible. What do you know about the Czech Republic? 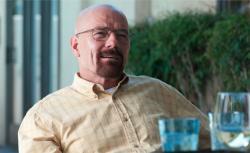 View a chart of the bad behavior of Breaking Bad’s Walter White in Season 5.